Other smaller offerings may have had both features, but they also seem unreliable. I wanted control of my links. YOURLS has a really nice admin page, including good stats. Enter YOURLS; a self-hosted link shortening service that is created by two amazing WordPress plugin developers: Lester Chan and Ozh Richard. They created YOURLS in a WordPress-like fashion, with developer goodies such as hooks (actions and filters) and plugin capabilities, so you can easily modify how the application works. You can set up YOURLS however you want, including making it a public service, public stats, etc. or making it private. I set up a YOURLS installation on my new katz.si domain, which was a snap, except for one minor snag caused by HostGator’s security rules. You do need to be able to set up a database and edit one configuration file, but other than that, super-simple. They also have a WordPress plugin that links your WP installation with YOURLS, aut0-generates links, and works like a charm. Once it was installed, I became a link-generating fool. I was clicking the links to see how well the redirections work (they work well! ), but the test clicks were logged — this pissed me off with bit.ly and other URL shorteners: don’t offer a way to not track logged in users! I have long thought that this is ridiculous. 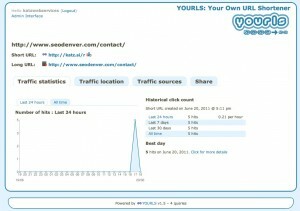 In all, my experience was rewarding: it was very easy to set up the YOURLS installation, once up I have a very configurable and fun URL shortener. I get to build links to a domain I control, which is nice for SEO. good suggestion. yourls is awesome. cant believe it has such a small following.